This is probably due to the fact that we don't exactly know how the pyramids were built in the first places. There are different conflicting theories. Is Wikipedia misleading me here? Is there an accepted historical version of how the pyramids were built that can be used to effectively debunk the pseudoscience? But the process of building pyramids, while complicated, was not as colossal an undertaking as many of us believe, Redford says. Estimates suggest that between 20,000 and 30,000 laborers were needed to build the Great Pyramid at Giza in less than 23 years. By comparison, Notre Dame Cathedral in Paris took almost 200 years to complete. the image most people have of slaves being forced to build the pyramids against their will is incorrect. Forget the myths about massive numbers of slaves or Jews building the great pyramids, Egypt‘s chief archaeologist argues this week. He says Egyptian researchers have found the tombs of more pyramid builders, and in those tombs more evidence that free men erected these monumental tributes to the ancient pharaohs. And continues with numerous links to even more articles. As to the assertion that it was impossible to do many of the things that the builders of the pyramids did, that is a common misconception people seem to have. Most people don't consider ancient humans to have been as intelligent as we are, when in fact they possessed the exact same intellect as we do today, just not the technology. And since we rely so much on advanced technology, many people make an argument of incredulity because we just don't do things the old fashioned way. Some people have started to collect reconstructions of those methods on the web. The same argument regarding the mathematical precision could be made. Also, in ancient times, without our calendars and clocks, astronomical observations played a much more important role than today (i.e. when to plant, when to expect rains, etc.). Again, ancient humans were not stupid. A good program to watch would be Mark Lehner's This Old Pyramid, where they attempt to build a small scale pyramid using contemporary tools. It was done with a budget, time, and people constraint, so they did end up having to use some shortcuts. this is another case where hands-on, trial archaeology I think really proves some points. Because even the men, even the experienced masons here, were saying vehemently that this isn't going to work, and they were almost angry and irritated about it. And lo and behold, it got off the rollers. I'd also recommend a look at his book, the Complete Pyramids. We know they used sleds and rollers to move heavy objects, remains of both have been found, and evidenced in reliefs like in the tomb of Djehutihotep. To debunk parts of the third claim, you could use Radosophie , a fun-science just build for such debunctionarisms. Since there is no English translation, I will try a brief roundup: You take a typical bicycle from the Netherlands. There you take some measures, like pedal way, perimeter of a wheel, light and bell. Then you mix up all numbers with all mathematical operators you know, as well as some smaller numbers like 1, 2, 3. You can then generate every number you need within a few steps, the gravity constant, Eulers Number e, Pi and the fine-structure constant alpha and so on, to a surprising precision. The same way you can do geometrical measurements at historical buildings, and conclude, that the Egypts knew the half-value period of plutonium. The really compelling evidence that pyramids were built by people with no advanced technology is that they sometimes fell down. Not only that, but in one case the design of a part-built pyramid was altered as a result of a failure in another (I think this is the Bent pyramid at Dahshur but I don't have the reference to hand so can't be sure). The argument above was made in the book The Riddle of the Pyramids, Kurt Mendlesshon, Thames and Hudson 1974. This is a great source of debunking of strange theories about them and also a source of many interesting ideas about how and why they are built. I think he argued that they were a huge public works program that was instrumental in forging a coherent Egyptian state. Many of the myths that ascribe mysterious powers to the people who built great ancient moments like the pyramids are better explained by survivorship bias. The people who built them (like the people who built Europe's great cathedrals) didn't just build great monuments: they also built dodgy ones. The dodgy ones fell down and today we only see the great ones that survived. The Mendlesshon theory elaborates on that process by showing that the builders learned in real time what worked and what didn't and altered their unsuccessful designs as they progressed. There seem to be several theories about how you can build a pyramid using then available systems and techniques. It is of course hard to find out how it was done, but there seem to be valid possibilities. I see no big problems raised in normal sources about the problems that you raise. Unless I read publications as this one wrong, the discussion is about how it was done exactly, not about if it was possible at all? Not the answer you're looking for? Browse other questions tagged history egypt . 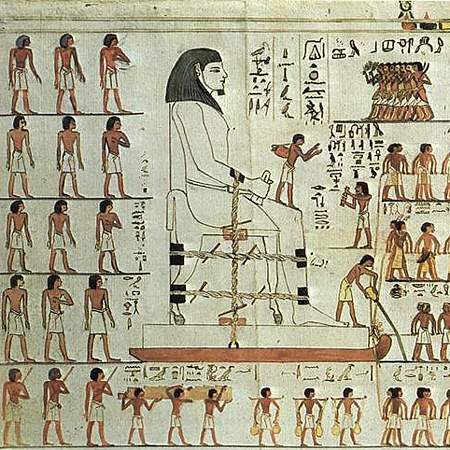 How did the ancient Egyptians lift 700 tonne stones? Were our recent ancestors as intelligent as we are? Was the Sphynx at Giza originally carved with an eagle head?